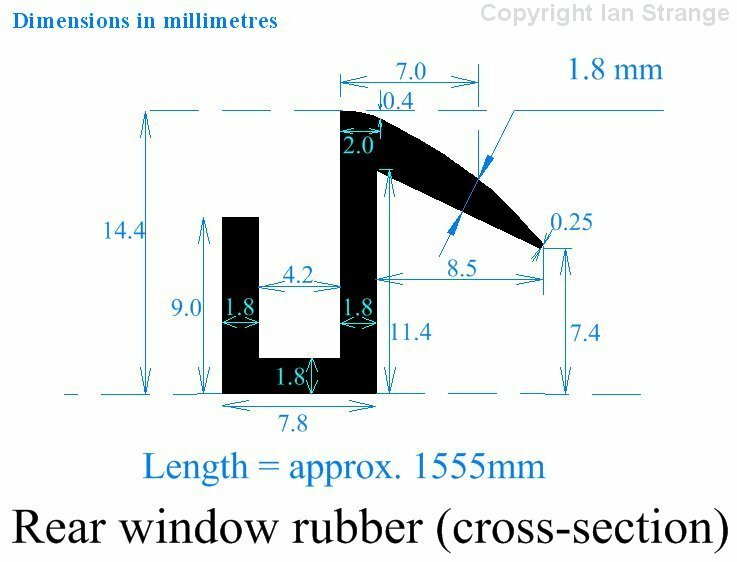 I have made scale drawings, shown below, from the rubbers fitted to my 1949 Saloon. I believe these to be the original items, with the possible exception of the rear window rubber. I have made allowances for shrinkage of the sponge rubber parts, in view of their age. Most, but not all, rubbers are covered here so far. Although these are mostly body/chassis rubbers, I've included the top radiator hose since this is of an unusual design. Also included is the plastic wing piping. When shopping around for replacement rubbers, you will probably find that few exact matches are available. But there are some close matches and also other rubbers that can be trimmed, slit, etc. 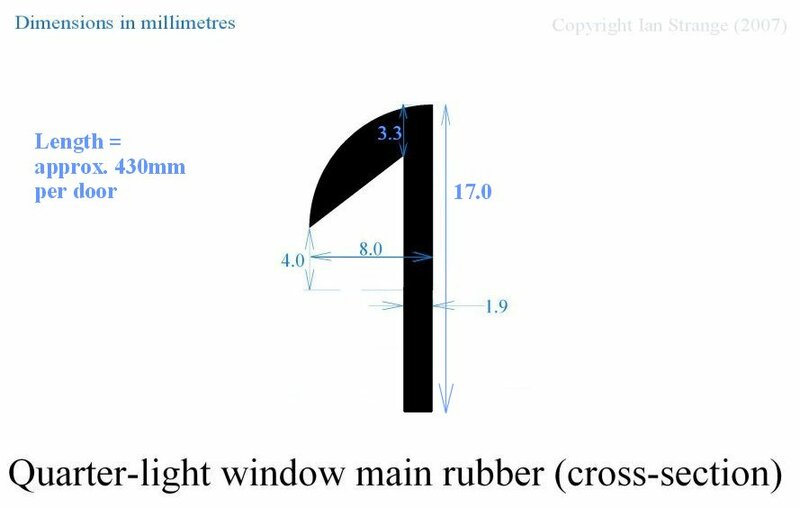 to provide the required shape. The bonnet rubber was fixed onto the bulkhead with brass escutcheon pins. Unfortunately, these gave an easy path for rain water to attack the plywood bulkead, and so the pins will either need to be effectively sealed in, or else omitted altogether. 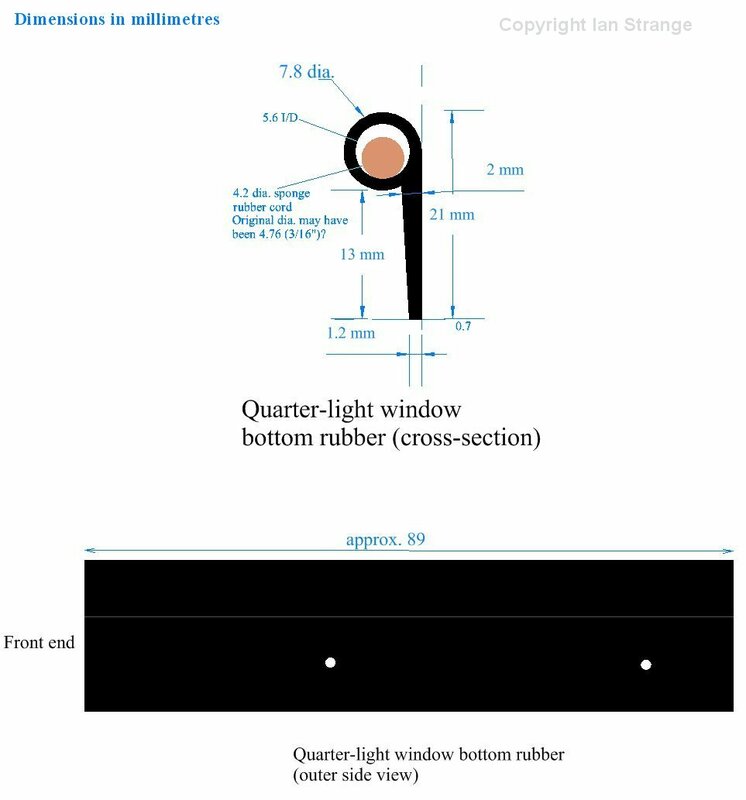 The front flange needs to be trimmed to a slight taper at each end, as shown in the drawing below. A remake of this seal (produced in the 1980s) differs slightly from my original seal. 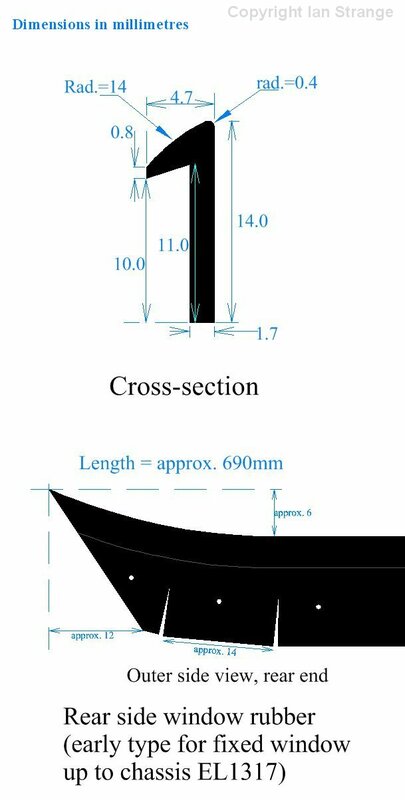 The drawing below is a front view of the 300mm (1 foot) or so of one end, to show how the flange needs to be tapered. This original design of rubber had another slight shortcoming: The thin (2.7mm) flange that the bonnet actually rests upon, is too flimsy. Keep in mind that the bonnet curvature is less than that of the bulkhead and the radiator cowl. This is deliberate, so that when you lock the bonnet down, it will bend to the correct curvature, and will not rattle. But the bonnet rubber tends to collapse, resulting in a bonnet that is slightly too flat. 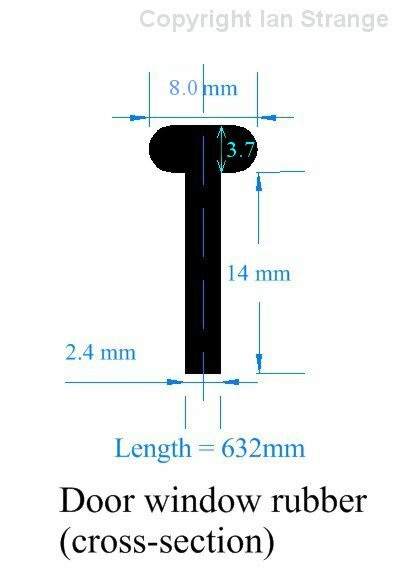 It might be better to make a rubber with a much thicker flange? The front end of the bonnet does not have a rubber seal. 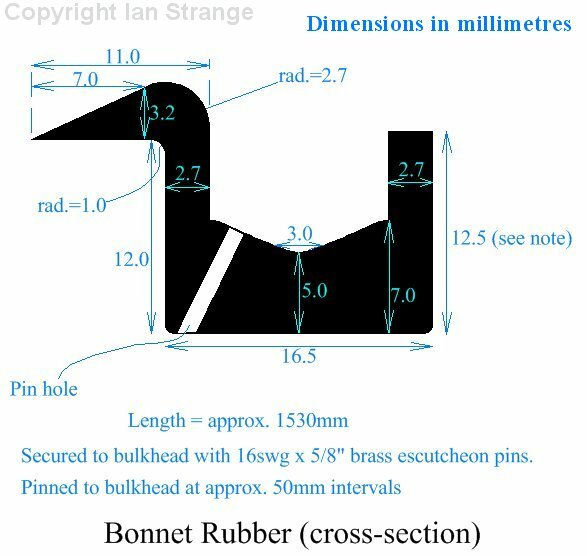 It uses a traditional type of canvass bonnet tape, 1/2" (12.7mm) wide and approximately 3/32" (2.4mm) thick. 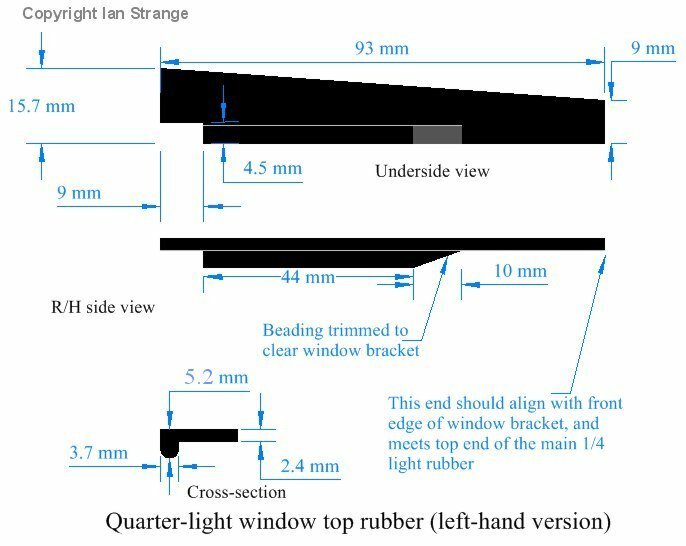 The screen rubber (outer) is shaped to permit the windscreen wipers to park off the screen, and cross the seal without too much damage. Later ACs had wipers parked on-screen. Care needs to be taken when fitting this rubber around the screen corners, as the outer flange is prone to cracking. Warming in water can help with shaping any rubber seals. The 1/4 light rubbers shown here are for the earlier type of 1/4 light fitted on ACs up to around 1952/53. 4 door Saloons have the later design not featured here. The above shown seal is trimmed down from a t-section seal similar to the one shown further down this page (for the door window). This seal fits into the top of the 1/4 light window. It extends forwards up to a point level with the front edge of the top window bracket, where it meets the end of the front seal. The corner cut away at its rear end, clears the window frame pillar. 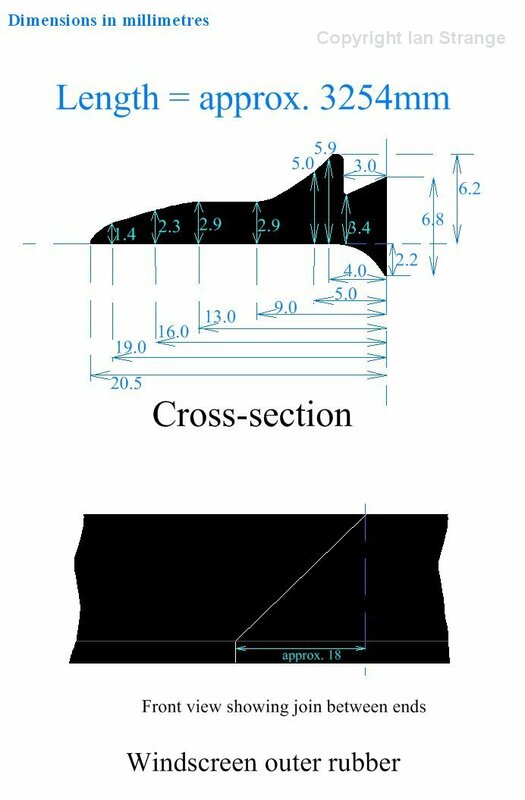 Most of the dimensions (apart from the cross-section) are approximate, since the original rubbers were trimmed to fit each individual door. The above seal is fitted to the front edge of the quarter light window, and extends from the front edge of the top window bracket to the front edge of the bottom bracket The seal illustrated differs slightly from a remake produced in the 1980s. This seal fits at the bottom of the quarter light window, on the inside. This is fitted to the door outside the main drop-window, and clamped in place by an aluminium strip. This is fitted to the outside lower edge of the side window frame. This is for the early type of fixed window, as found on ACs up to chassis EL1317. My original seal had evidently been trimmed along the flange from whatever the commercially available size had been - possibly a double-flanged section cut lengthways down the middle to make 2 seals? 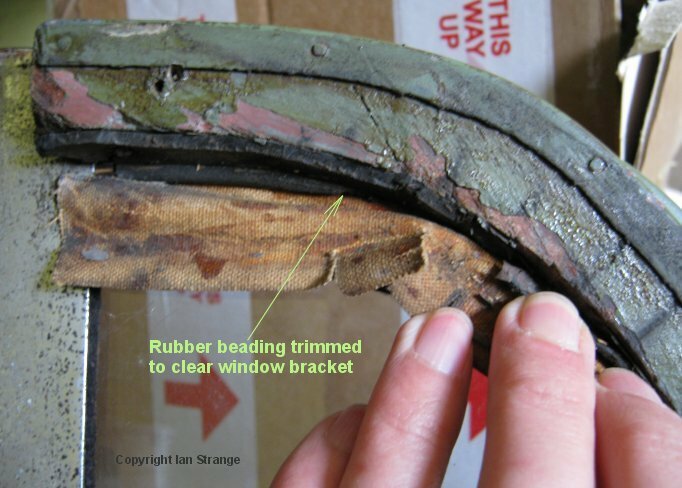 The top edge of the side window frame was sealed with what looked like bitumen, which dries out. A modern sealant would be much better. The rear windows have no frame, and are secured with panel pins (rather like traditional old house windows). Also helping to secure the rear windows, are the thin wooden trim frames, with screws that dig into the edges of the rubber seals. 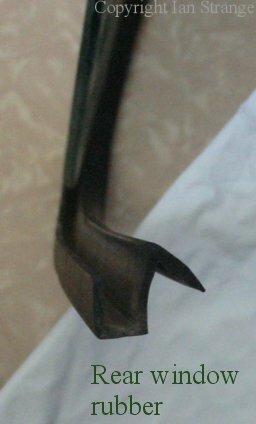 The head-cloth edges are tucked between this window seal and the wooden body frame. 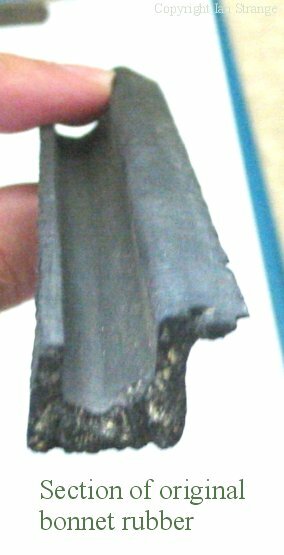 The rubber that I measured for the scale drawing, does not look original in terms of aging, although it is certainly pre-1970. The 9mm deep inner flange appeared to have been hand trimmed to match the inside edge of the wood trim.